Check out the images on this page to see some of the wonderful contributions from previous years' papers. Click on the images to see larger versions. Left and center visualizations by: Martin S. Feather (California Institute of Technology), Steven L. Cornford (California Institute of Technology), James D. Kiper (Miami University) and Tim Menzies (West Virginia University), from “Experiences using Visualization Techniques to Present Requirements, Risks to Them and Options for Risk Mitigation” in Proceedings of REV’06 (with kind permission). 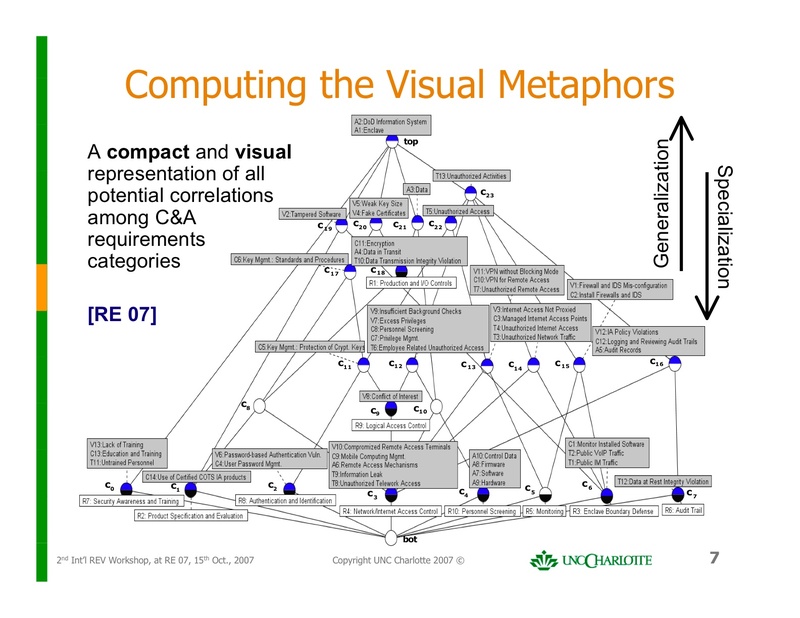 Right visualization by: Neil A. Ernst, Yijun Yu and John Mylopoulos (University of Toronto), from “Visualizing Non-Functional Requirements” in Proceedings of REV’06 (with kind permission). With the increasing complexity of software requirements, problems of traditional requirements engineering techniques, including the use of unstructured text and lists, are becoming increasingly apparent. Allowing a large amount of unstructured textual information with redundancy, these approaches typically suffer in understandability, scalability and analysis. 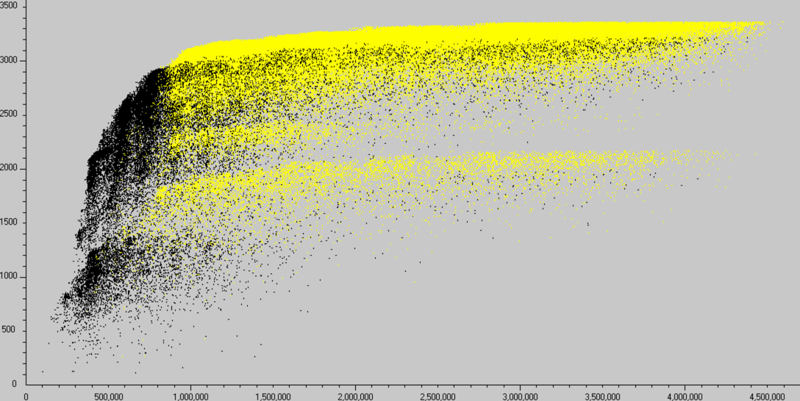 Visualization techniques have long been used to overcome these problems in other fields. In the field of education, diagrams are regularly used to aid learning. In various classical engineering disciplines, visualization is used heavily in modeling and simulation. While software engineering has begun to follow in the footsteps of these disciplines with the emergence of model-based development techniques, visualization has largely been at the design level. 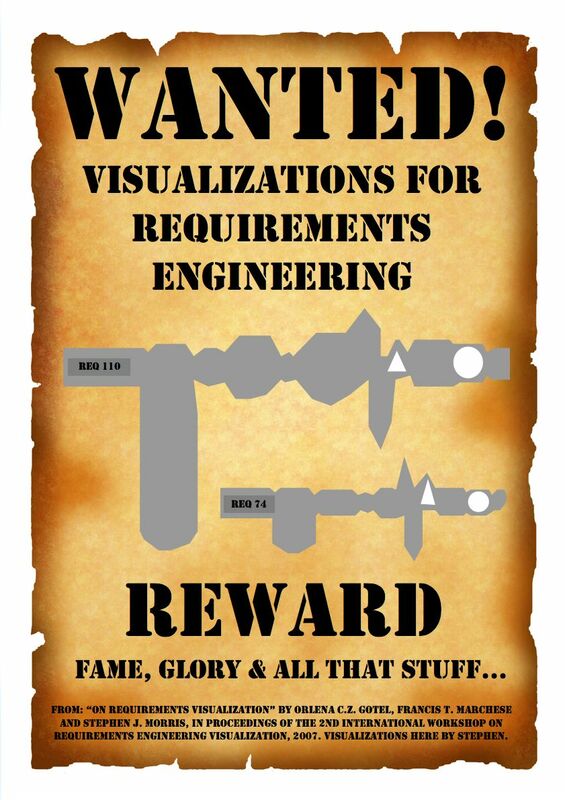 This workshop aims to explore visualization techniques in the context of requirements engineering. There are many potential use cases of visualization. 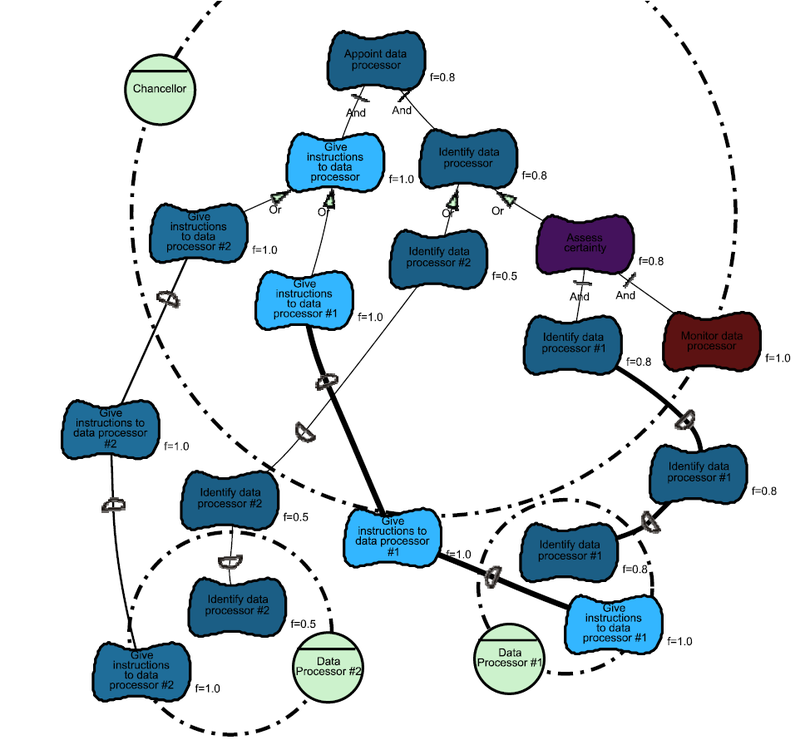 Visualization may improve understanding of requirements by showing the overview, providing navigation facilities for incremental exploration, and by conveying a rich set of information through concise and intuitive syntax. Visualization may also allow the same set of information to be viewed in different perspectives by customizing concepts and relationships according to stakeholder interests. This could promote collaborative development, and support the negotiation and prioritization of requirements, leading to a scalable methodology. 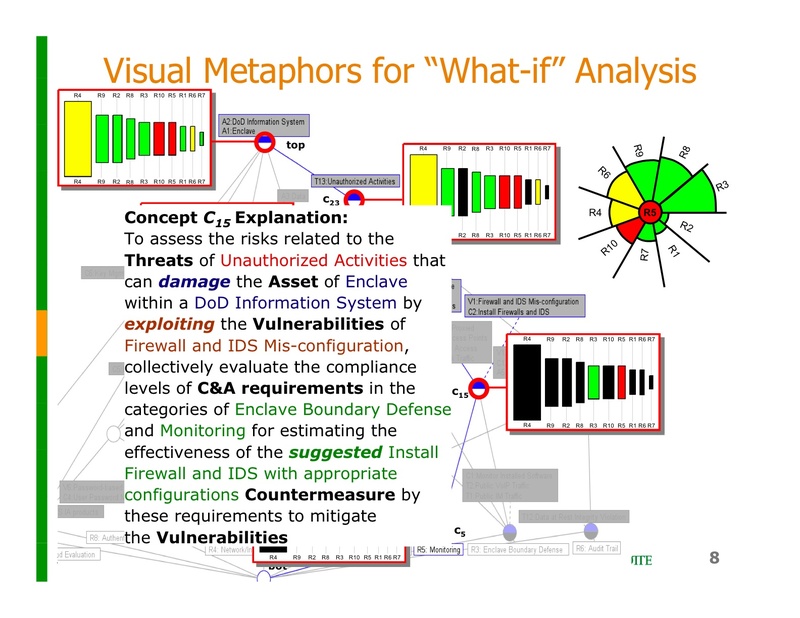 Visualization may also facilitate analysis of structured requirements, for example, by providing incremental guidance in formal verification. Visualization, as an intuitive practice, may facilitate requirements elicitation and analysis in many other innovative ways. However, while innovation is admirable, practicality is almost always a necessity. 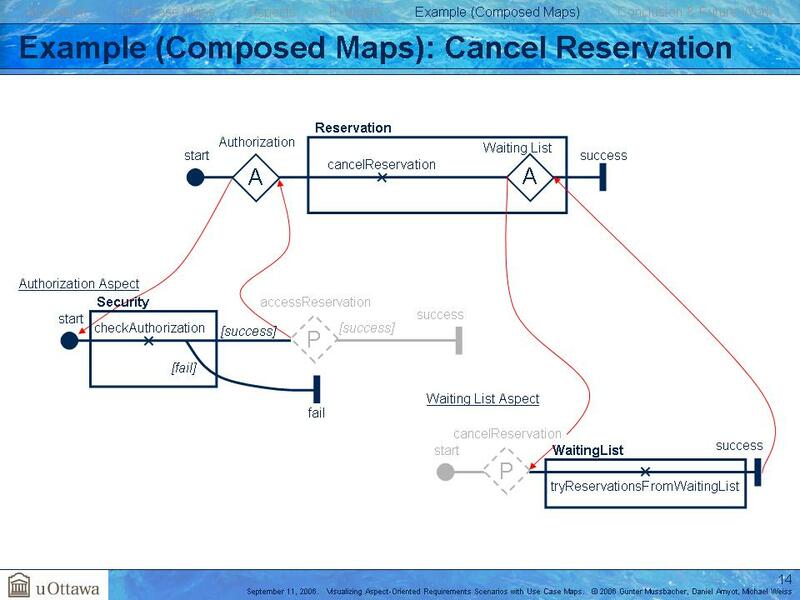 While visualization techniques may be innovative, they have to be practical, like the traditional requirements engineering techniques, in order to be accepted. The fact that the software industry largely uses traditional requirements elicitation and analysis techniques suggests that practicality is a trait hard to achieve. Thus the workshop will also examine the practicality of visualization techniques. 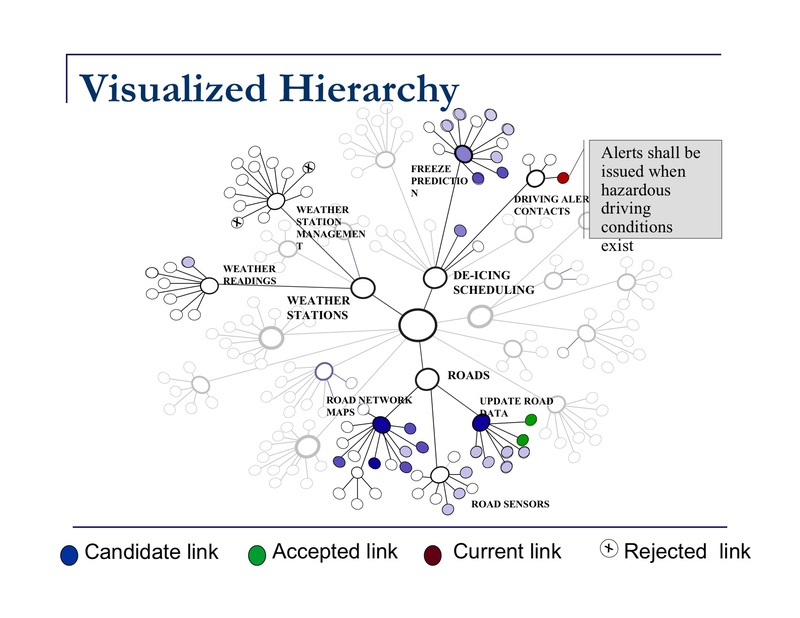 Both visualizations by: Robin A. Gandhi and Seok-Won Lee (University of North Carolina at Charlotte), from "Visual Analytics for Requirements-driven Risk Assessment" in Proceedings of REV’07 (with kind permission). 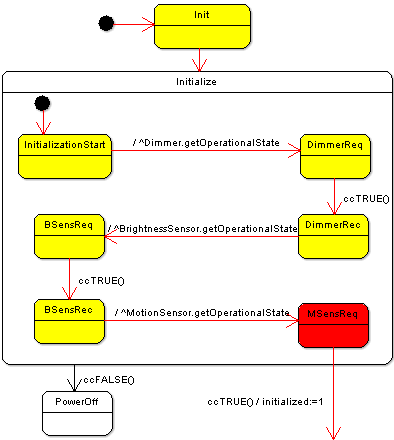 Left visualization by: Sascha Konrad, Heather Goldsby, Karli Lopez and Betty H.C. Cheng (Michigan State University), from “Visualizing Requirements in UML Models” in Proceedings of REV’06 (with kind permission); right visualization by: Chuan Duan and Jane Cleland-Huang (DePaul University), from “Visualization and Analysis In Automated Trace Retrieval” in Proceedings of REV’06 (with kind permission). The format of REV’08 will provide attendees with an opportunity to become familiar with a new topic and establish a good foundation for discussions about visualization in requirements engineering. We intend to make the workshop discussion and interaction oriented. Paper presentations will be used to provoke dialogue and participants will break out into small groups for more detailed discussion. These small groups will be organized around common themes or goals identified either from the papers, or by the participants during the workshop. At the end of the day, there will be a plenary session where the groups report back to the workshop as a whole on the results of their discussion and future work. Results may be used as a basis for continued publications. Left visualization by: Gunter Mussbacher (University of Ottawa), Daniel Amyot (University of Ottawa) and Michael Weiss (Carleton University), from “Visualizing Aspect-Oriented Requirements Scenarios With Use Case Maps” in Proceedings of REV’06 (with kind permission); right visualization by: Irwin Kwan, Daniela Damian and Margaret-Anne Storey (University of Victoria), from “Visualizing Requirements-Centered Social Network to Maintain Awareness within Development Teams” in Proceedings of REV’06 (with kind permission). Position papers (3-5 pages) Short papers state the position of the author(s) on any of the topics within the scope of the workshop. 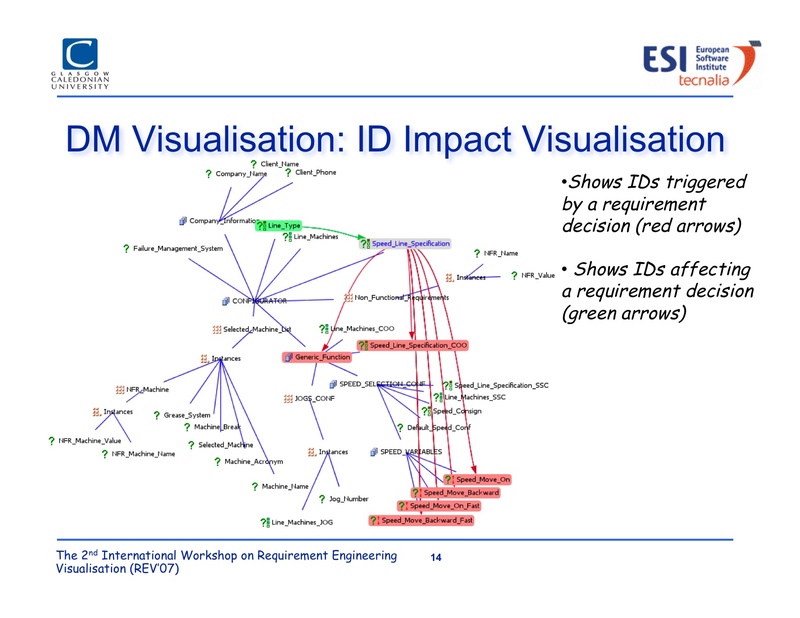 For example, position papers could describe initial experience with a particular visualization technique, propose an area of requirements engineering that could benefit from more innovative forms of visualization or illustrate how visualization techniques from other domains may be applicable to requirements engineering problems. Position papers will be evaluated based on their potential for generating discussion, and on the originality of the positions expressed. Full papers (8-10 pages) Full papers describe and report on the evaluation of visualization techniques in support of requirements engineering activities. For example, a full paper could describe how a comparative evaluation of visualization techniques was performed in practice, either by controlled experimentation in the lab or in an industrial setting; or it may present the results of the actual performance of tools, methods or processes that embed visualization components, in lab-based experiments or field trials. 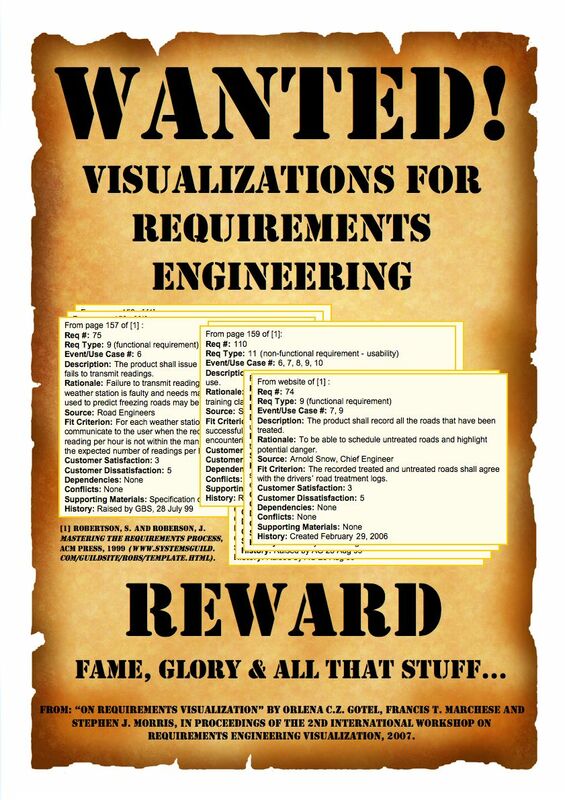 Survey papers that review and critique the range of and/or use of visualization techniques applicable to requirements engineering are also invited. Full papers will be evaluated based on the originality and significance of the contribution, soundness of the validation process or quality of the survey procedure, and on the broader applicability of the results. RE’08 workshop proceedings will be published online in the IEEE CS Digital Library. Please use the IEEE template as per the main RE-08 conference for your submission (formatted according to the 8.5x11 inch IEEE CS proceedings format). For downloading instructions and templates, go to the Author Forms web page of the IEEE Computer Society. One author of an accepted paper is required to register for the REV'08 workshop by 7th August, 2008 (else the paper will be withdrawn). All deadlines are 23:59 Apia, Samoa time. Left visualization by: Jane Cleland-Huang and Rafal Habrat (De Paul University), from "Visual Support in Automated Tracing in Proceedings of REV’07 (with kind permission); right visualization by: David Sellier and Mike Mannion (Glasgow Caledonian University), from "Visualising Product Line Requirement Selection Decision Inter-dependencies" in Proceedings of REV’07 (with kind permission). Visualization by: Martin S. Feather (California Institute of Technology), Steven L. Cornford (California Institute of Technology), James D. Kiper (Miami University) and Tim Menzies (West Virginia University), from “Experiences using Visualization Techniques to Present Requirements, Risks to Them and Options for Risk Mitigation” in Proceedings of REV’06 (with kind permission). Brian Berenbach is the manager of the requirements engineering competency center at Siemens Corporate Research, Inc., operated for Siemens AG, a global company with earnings in excess of $90 Billion. Mr. Berenbach's responsibilities include training Siemens employees and conducting research and process improvement in all aspects of requirements engineering. In addition to his work for Siemens, he has given courses in requirements analysis for the Army, and has conducted professional development seminars for the IEEE. His research interests include formal methods and visualization techniques in requirements engineering. Mr. Berenbach holds graduate degrees from both Emory University and the USAF Institute of Technology. Mr. Berenbach was an invited speaker at RE'06. Olly Gotel is an Assistant Professor of Computer Science at Pace University in New York City. Olly has been active in the area of Requirements Engineering for over 15 years and holds a PhD from Imperial College, University of London, on Requirements Traceability. 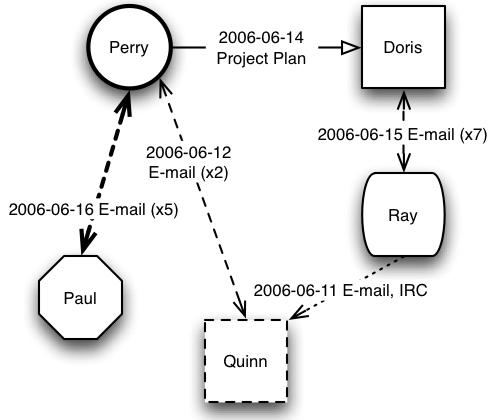 Olly was the co-author of the most influential paper over a 10-year period from the 1st International Conference in Requirements Engineering held in 1994 and a keynote speaker at the 2007 International Symposium on Grand Challenges in Traceability. Olly helps to run the New York City Software Process Improvement Professional Network and is the co-chair for a second RE'08 worskhop (see MERE'08).